The Taj Garage: Back to work! The past two weeks have been spent making little visible progress at all. On the one hand there have been a couple of scorchers, which really make work impossible after about midday with the heat, but the tasks I've needed to complete are pretty much invisible anyway. 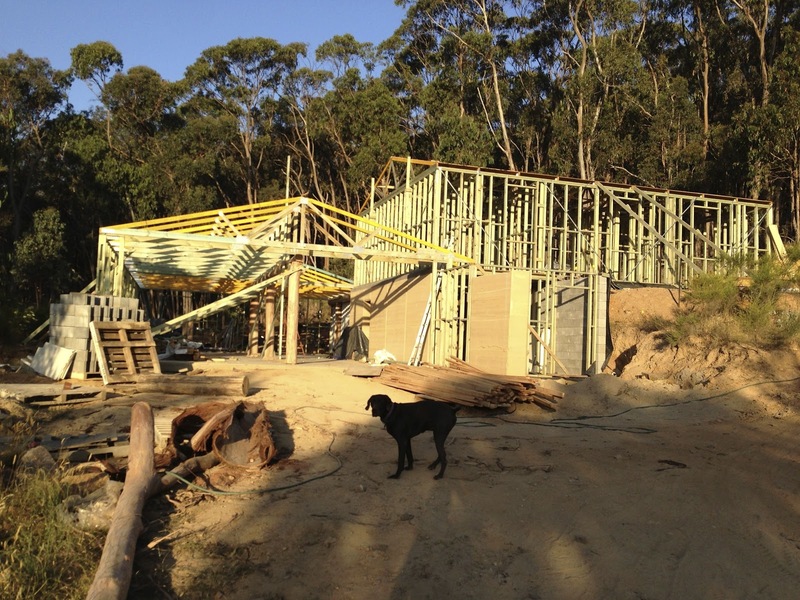 When we put the trusses up, we quite literally threw them up there and fixed them more-or-less in place, leaving the fiddly business of aligning and tying everything down to me, which are jobs which don't need the extra manpower we had available. So that's what I've been doing. We've got these heavy duty, imposing logs holding up the roof structure, and using these flimsy little 0.8mm thick steel fixtures just wouldn't look the part. 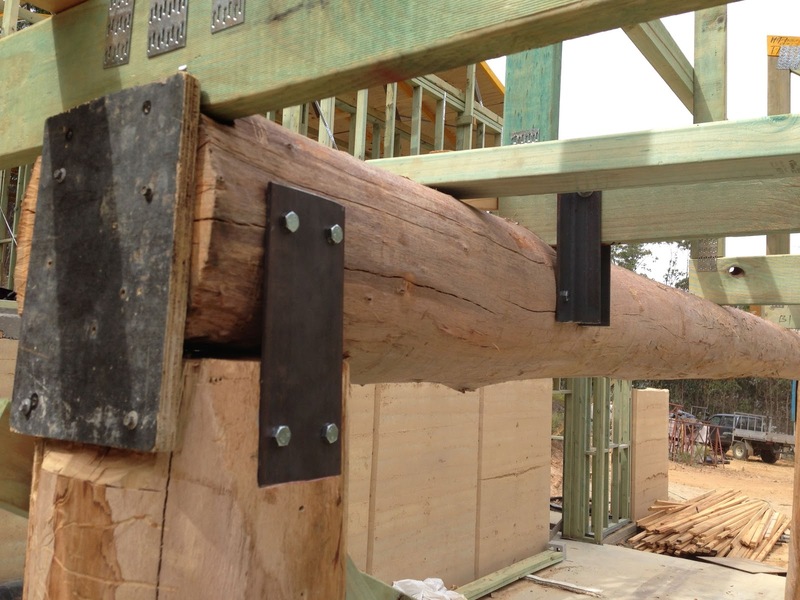 The 40mm nails used with these grips would barely reach the hard heartwood of the logs, so over time as the sapwood aged the fixtures would weaken. Big logs need serious fixtures! So with that in mind, I've devised a system which will certainly exceed the tie-down requirements, and also look right against the imposing log structure. For the trusses, I'm using 50x50x5mm steel angle, cut to 250mm lengths and bolted to the bottom chord of the truss using M12 allthread. The other end is fixed to the log using M10x75mm coach screws. 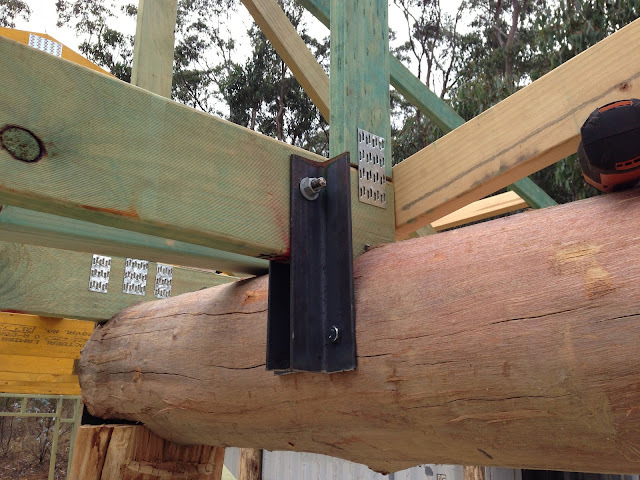 To fix the beam to the poles, I'm using 100x5mm mild steel plates cut 250mm long, checked in and fixed to the logs using M10x75mm coach screws. I started cutting all 50 or so pieces of steel using the chop saw, but it was just too slow going and so I broke out the oxy set again and made short work of it all. Even so, half a day later... and I still have all the drilling to do before I can fit them all in place. I have a drill press here at home which will make it much easier than drilling hand-held with my cordless, so I've brought all the steel back to Melbourne.. hoping I can get it done before next weekend! 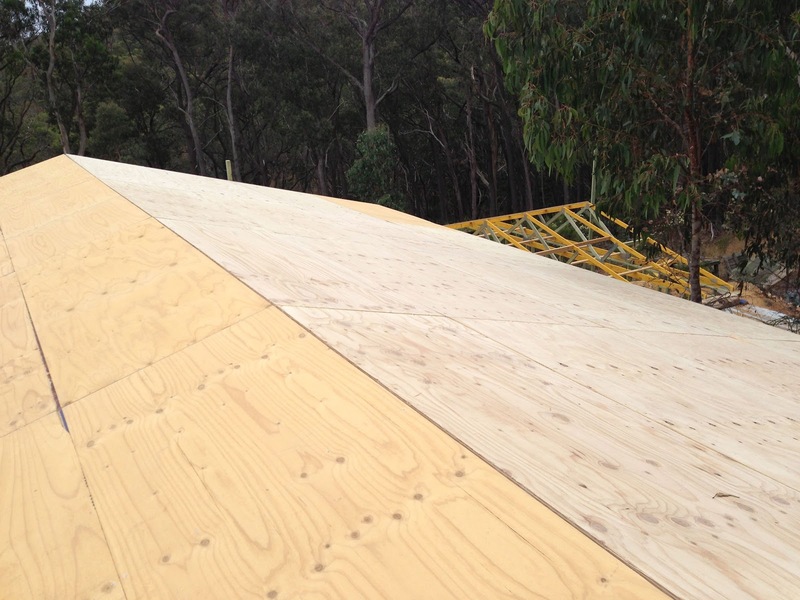 So in the meantime, I set about finishing installing the plywood to the dwelling roof. 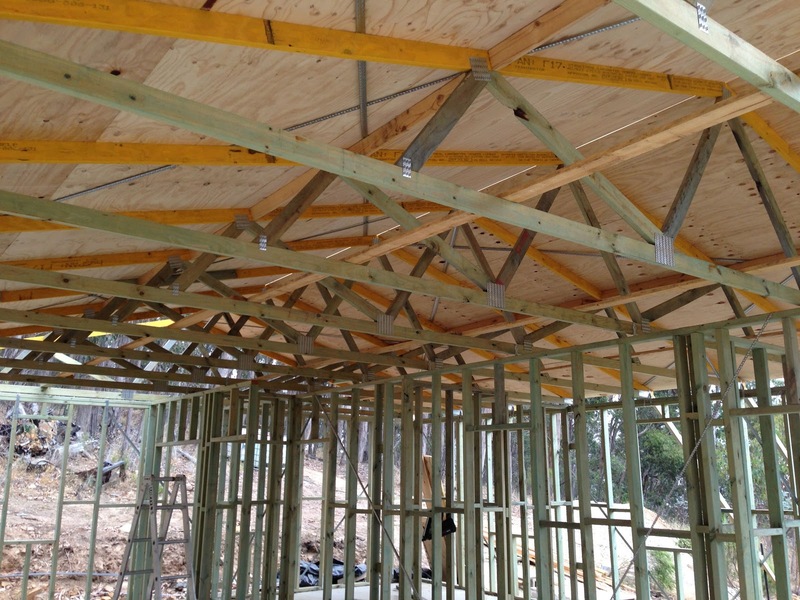 No major drama's here, with the minor exception that after about the third sheet in the first row, the trusses are slightly off square which means the edge of the ply doesn't land in the middle of the truss properly, requiring a slight adjustment with the circular saw. This however means that the rest also need adjusting a little.. which is a royal pain in the proverbial. Lesson learned for the garage trusses: Make sure they're perfectly square and spaced accurately! 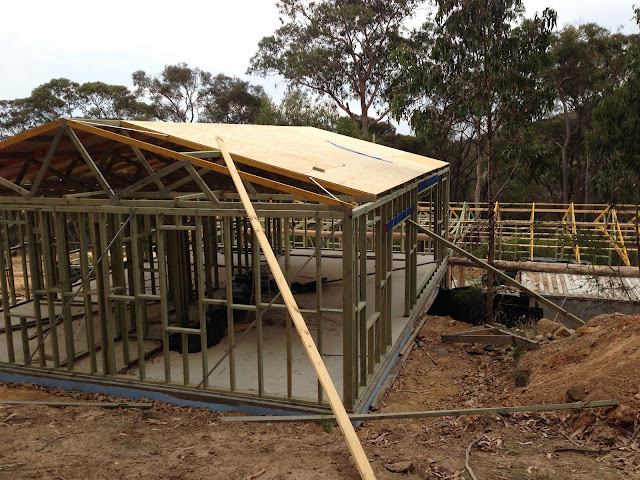 Next day with the threat of rain showers I thought it best to protect the ply until the roof can go on, which won't happen now until the Hebel panels are erected. I have plenty of leftover concreter's plastic lying around, and so I dragged this up onto the roof, gave it a bit of a clean and secured it with roofing battens. These battens will remain in place permanently, and I think I'll just cut the plastic away when it comes time to install the Anticon blanket and roofing tin. Or not, I'm undecided yet. 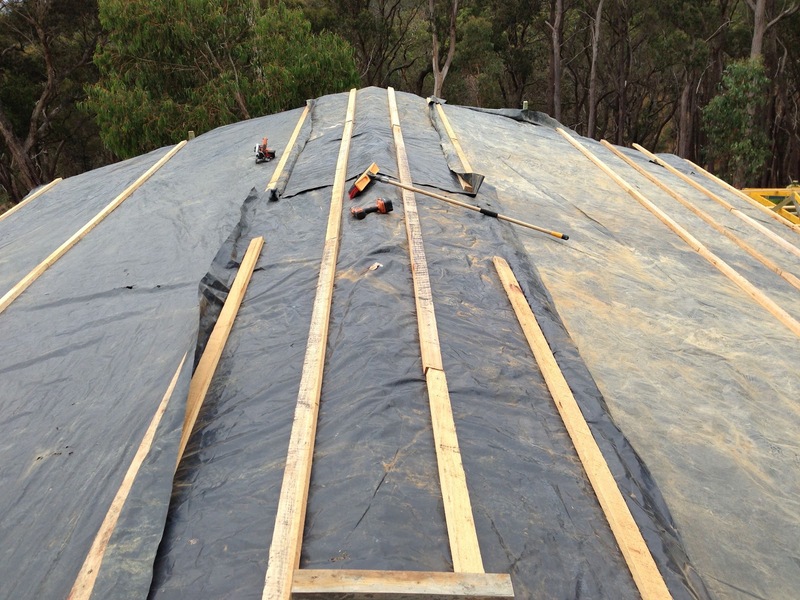 The approved BAL-FZ roofing system obviously doesn't include a plastic membrane over the ply, so for the sake of adhering to the spec I'll probably remove it. Probably a dozen other things I haven't thought of yet.